And two makes a trend! Last month Berg London (yep, them again) published SVK, a comic from Warren Ellis and Matt Brooker. 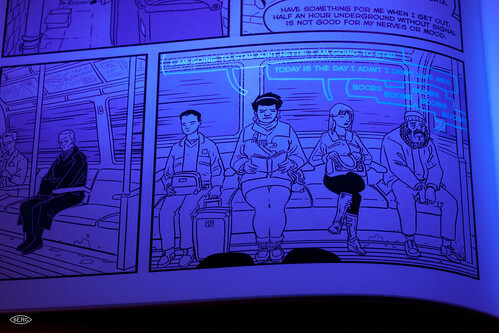 A critical piece of the story line is printed with invisible ink that you can only read with the "SVK object," a UV light source that's packaged with the book. I had a chance to see it in person when I was in London and it's very, very cool. The technique is integrated into the plot in a way that rewards the reader for investing the effort in reading in a new way. More like this please. And there's a lesson in here for designers that are crafting screen-based interactivity on top of classically narrative content: make sure the distraction and the effort that's required for readers to push, click, highlight, scrub, type, shake, tilt, etc. is worth it. If you're going to entice the reader out of their state of reading "flow," then make sure what you want them to do adds to their experience of your content.